The best thing Missouri ever did for Branson was make US 65 a fast way to get through that madhouse. Hmm. I'm used to seeing bicycles allowed on certain freeways in my area, but generally speaking, pedestrians are not allowed on freeways, apart from parallel recreational paths. Of course, I'm not sure whether or not this is a freeway. Looks like it from the photo. 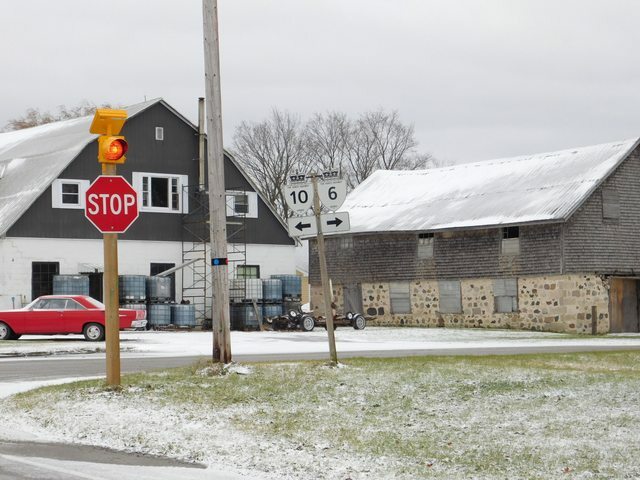 In Andover, MA, where MA 125 and MA 28 junction, the 'ramps' between them have the standard Mass no bikes/peds/horses sign, despite the fact that both roads in question allow such traffic. Always wondered about the legality of it, especially since it's right next to a state police barrack on 125. There is a small street that connects the two without using the ramps in the junction, so maybe that was there polite yet quasi-legal way of asking people to use that road instead. 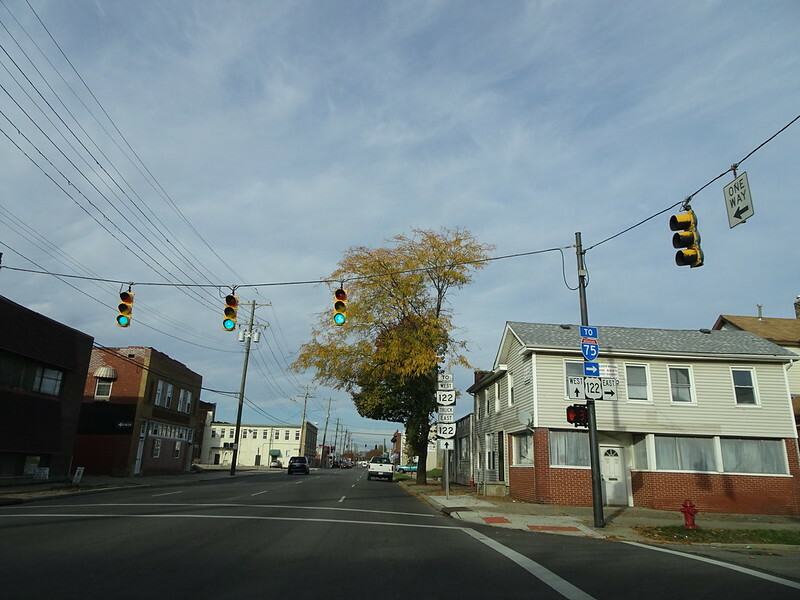 The junction in question. Note Gould Rd to north is the road that cyclists/peds/horses can use. 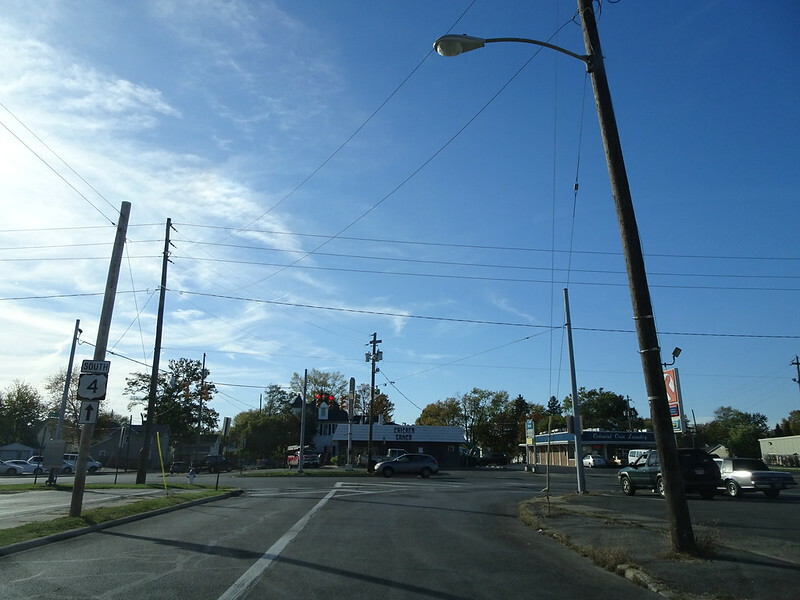 Streetview of one of the ramps, from MA 125 to MA 28 N/B. My understanding has always been that many traffic laws can be overridden by signs posted by a competent authority. Would these "no pedestrian" signs not count? The highway is an ordinary highway with businesses and postal boxes. This is what I mean by highway departments getting too aggressive and banning non motorized traffic from roads they have a legal right to be on. If it has a post office box it is a postal road as defined under the postal clause of the United States Constitution. Road law generally derives it's authority from this clause. Highway departments can not ban horses wagons and pedestrians from such roads. Highway departments can not change the status of such roads without permission of the post master general. Doing so could lead to arrests for interfering with the delivery of the mail. What do you think are the chances any one bothers to do the paper work on this? I think you'll have a hard time pulling the "post road" clause in court. As roads grew dramatically in the 20th century, the line between "post road" and everything else blurred substantially, to the point where you could define any stretch of road with a post box as a post road. Freeways don't have post boxes, so I don't think they're bound by the same rules as post roads. Additionally, I do believe local jurisdictions are allowed to parse sections of roads, in such a way that individual parts can have different rules. Judging by Google Maps, TN-100 between Simmons Road and Mifflin Ave is pretty clearly a freeway. There are no driveways or post boxes abutting the roadway, and the speed limit is 50 (low for a freeway but higher than most roads). Judging by this, the road should not be considered a post road, and therefore should be exempt from the rules that govern post roads. The Secretary shall not approve any project or take any regulatory action under this title that will result in the severance of an existing major route or have significant adverse impact on the safety for nonmotorized transportation traffic and light motorcycles, unless such project or regulatory action provides for a reasonable alternate route or such a route exists. 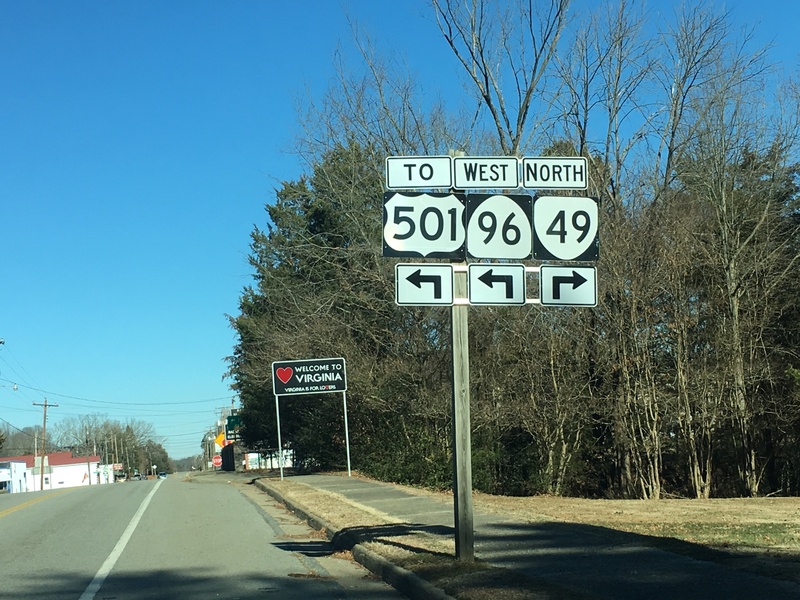 TDOT provided a reasonable alternate route when constructing the TN 100 Henderson bypass: the former alignment of TN 100 along Main Street, which remains accessible to pedestrians and other non-motorized traffic. There was never a right of passage along the new alignment before, so the state didn't sever or adversely impact any existing traffic by constructing a limited access facility that bypassed the old road. The U.S. Constitution only gives the federal government the authority to establish post offices and post roads. The Constitution does not establish what constitutes a "post road" nor does it give the postmaster general any authority over highways. Interstates can be considered post roads because intercity and interstate mail is carried on them. I frequently saw intercity mail trucks on the Mountain Parkway back when it was a Kentucky toll road, and pedestrians and horse-drawn vehicles (and bicycles) are expressly prohibited on that route -- and still are, even now with the tolls removed. I'm not so sure I'd want to ride a bicycle on those ramps. Or any part of Route 125 between Route 114 and I-93 for that matter. Borderline addicted to roadgeeking since ~1989. Considering that the states (or lower-level jurisdictions) own and maintain the roads, I'm not so sure the Constitution even applies directly. Perhaps relevant to the Post Road concept: until the 1840s, the Post Office Department only carried mail from one post office to another; there was no local delivery. So when the Constitution was written, and for half a century after, a “post road” would have only meant a road connecting communities large enough to have post offices (there were 75 post offices in 1789). Correct. Postal roads were designed to prevent the charging of tolls for postal vehicles. Then governments demanded the post office deliver the mail to government buildings. The courts had to get involved and they ruled a postal road is any road a postal worker needs to deliver the mail. There are postal addresses on interstates. These so far as I know are owned by the highway departments. These include rest areas. A postal worker can if he chooses walk to these and deliver the mail. There are rest areas within a few blocks of ordinary highways. A postal worker might choose to walk against traffic to do this rather that drive the long way around. An act of congress also made all railroads postal roads. A postal worker can drive his vehicle on a railroad service road and the railroad police can't stop them. They would generally do this only if a regular toad is blocked. They would generally do this only if a regular toad is blocked. If a regular toad is blocked, I'm pretty sure that the postal worker should see about getting a veterinarian out to the toad. US 81 is erroneously signed on I-29 northbound before exit 203. 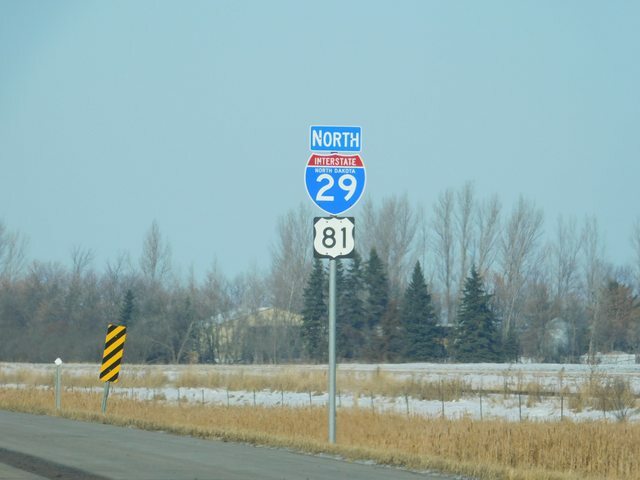 US 81 doesn't become concurrent with I-29 until north of the exit. 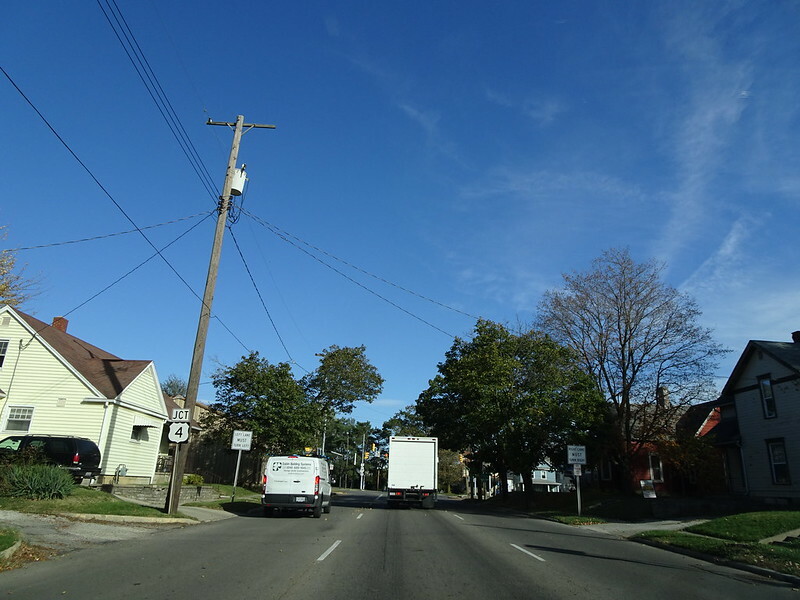 Here's an example on Grey Road 14 facing south at Grey Road 9 in Southgate, ON. The Highway 6 and 10 shields suggest that turning left would put you on Highway 10 and turning right would put you on Highway 6, but these really should be white-on-green "TO" shields. Judging from the odd numerals (clearview I think? ), I'm guessing this is a Grey County installation. 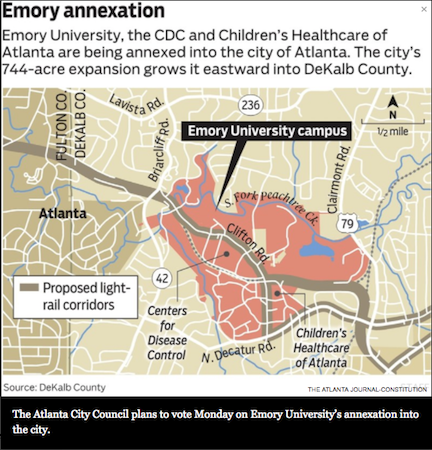 The city of Atlanta recently approved an annexation including the area around Emory University, which the AJC reported on here. But apparently, as a condition of the annexation, the entire region is being moved to Louisiana or Arkansas, according to this map in the article. That's supposed to be US 23/GA 155. How in the world they came up with 79, I have absolutely no idea. Dadgummit, that's pretty messed up. I don't know how the hell they got "US Highway 79" either. 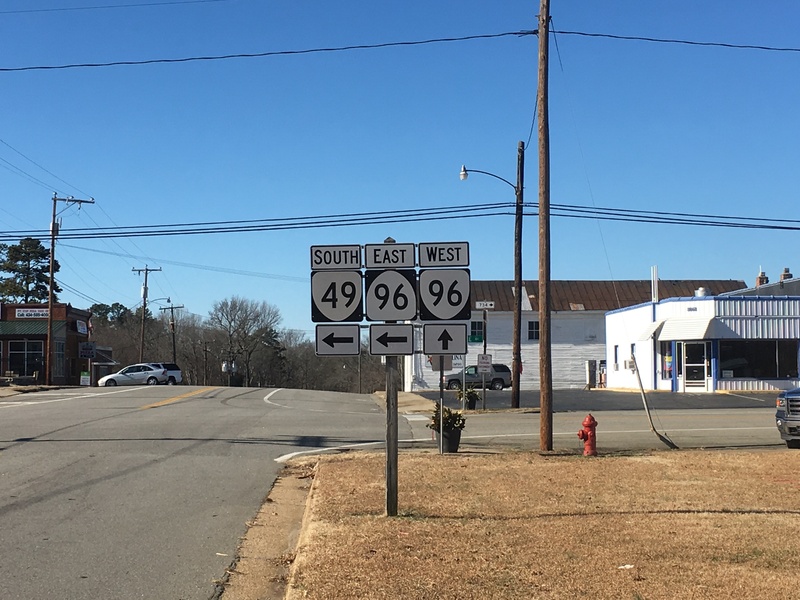 Georgia Highway 79 is way over here (not even close), and I can't find anything else that could possibly explain it. 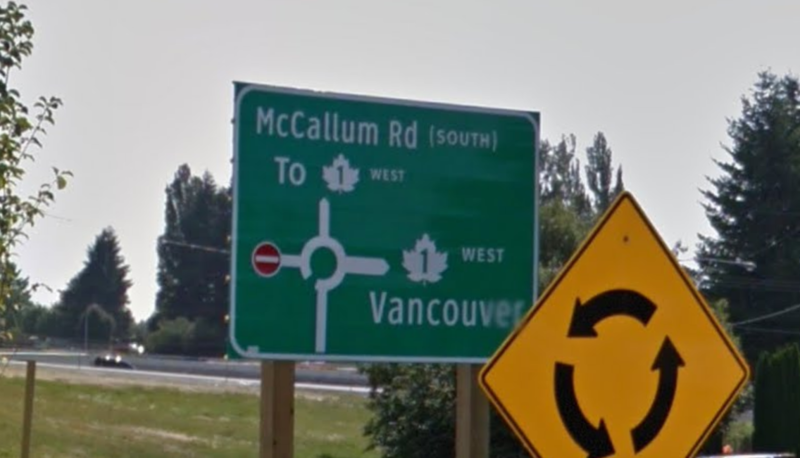 This one is long gone, but when the McCallum Road Roundabouts were first installed in Abbotsford, BC, the southbound roundabout diagrammatic accidentally labelled both entrances to Hwy 1 as "WEST". 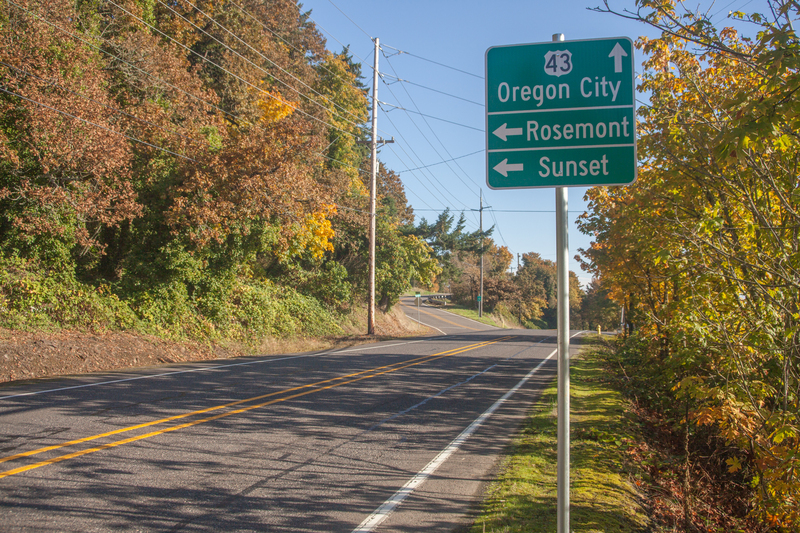 I noticed the greenout on the current sign just a couple days ago, so I was curious to see what this relatively-new sign had wrong. Not an error I'm used to seeing. Gone since 2011.